My mobile device has its charge socket off center? How many connector cables can be installed? Are there further connector cables / adapters? Can I dock my Apple Lighting mobile devices with bumper / protective case? All Apple products with 30-Pin connector or Lightning connector (nearly all apple products from 2003) are compatible. 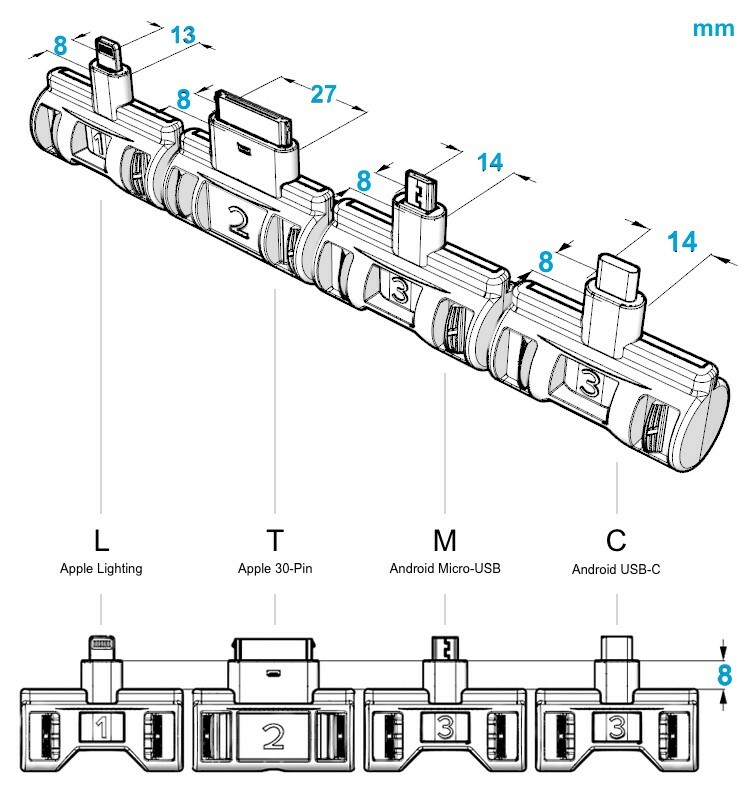 nearly all mobile devices with Micro-usb or usb-C connectors (mobile devices of the actual top 10 producer with Android, Windows, Symbian or Blackberry operating system) are compatible. please use our configurator to check the compatibility of your mobile devices. the open geometry of udoq enables nearly all mobile devices to be docked and we edit our configurator daily. however we cannot check all mobile devices personally and therefore we are really happy to get information about missing compatible or incompatible mobile devices from you. hereto please send an email to config@udoq.com. Select your first mobile device on the page configurator with he menu BRAND, TYP, NAME and it will be displayed proportionally on the udoq below. select now your second device in the same way. the more mobile devices you choose, the longer udoq gets. the number of cables that exceed the starter kit (L, T, M, C,) will be listed and stored in the shopping basket. you can delete mobile devices with the – (minus) symbol to the right of the selection menu. don’t forget to safe space for your guests mobile devices, by selecting additional mobile devices. the following order process allows to edit udoq and cables size and number. Each udoq can be equipped with the udoq connector cables (L – Apple Lightning, T – Apple 30-Pin, M – Micro-usb-b 2.0, C – usb-C 3.1) to fit the most common mobile devices worldwide. Depending on the product-bundle udoq connector cables can be included in the box. A basic udoq aluminium profile does not contain any cables. However, all connector cables are separately available in this shop and can be added to an empty profile in the web shop. The preinstalled or additional connector cables (L, T, M, C,) are connected to your computer /laptop, original power adapters of your mobile devices, an active usb hub or a separate multi port usb charger. Mobile devices can be docked horizontal. if the socket is not in the middle and your mobile device appears angled, you can level it with the U adapter. the support plate is adjustable in height by rotation and can be fit precisely under your mobile device for perfect support. If the charge socket of your mobile devices is not in the middle and your mobile device appears angled, you can level it with the U adapter. the support plate is adjustable in height by rotation and can be fit precisely under your mobile device for perfect support. Any number and variation of the (L, T, M, C,) connector cables is possible. the width of the mobile devices will limit the number of connector cables and adapters. Depending on the demand we will offer other connector cables. the actual cables are compatible to 90% of all mobile devices. Can I dock my mobile devices with a protective case / bumper? The connectors of the udoq cables can be adjusted in height to adapt to most protective cases. Open the adapter, by pushing the two clips towards the inside of the adapter. After opening the adapter, you can raise the connectors in 4 steps up to 8mm height, to adapt to protective cases with a maximum of 8mm thickness. Click the adapter closed before inserting into the udoq. The opening of the protective cases must be larger then the dimensions of the connectors shown below. If one or more mobile device does not charge, your charger may be to weak. In this case please connect the original charger of your mobile device with the udoq cable. Please be aware some chargers look similar, but offer different power outputs. If you don’t want to use your original chargers, we offer a 6-port USB charger, which is strong enough to power several large tablets and charges most mobile devices even faster.